Gadhimai Festival massacre in Nepal burning issue. HomeHot topicGadhimai Festival massacre in Nepal a Culcture. Animals are brought from Nepal and India (Bihar) to sacrifice their life to please Gadhimai goddess. The animals are brought by devotees on auto, bus ,car etc, cycle at the place and animals include rat, pig, pigeon, cow, bull, bufallow, goat, bird, snake, dog etc, and are managed callously while to bring at place. How festival takes place ? Thousands of devotees gathered at the Gadhimai Festival. They come before 1 day or at night yearly to manage Gadhimai Festival. The ritual of festival starts from lightening lamp on eating oil and 2 pigeons, 5 bufallows heads are cut by Pujari(priest) mercilessly. It is the start of Gadhimai festival. According to tradition and temple Committee report 300 priest gets license to kill the animals. The priest possess long Sura(knife) to kill animals. All animals which are brought from various places are kept in open area surrounded a net like structure of ropes or compound wire and birds wings are cut and throws at the tip of temple so they can’t fly. 3 to 4 thousand big animals are kept in open ground mainly bufallows and they are killed by the 300 priest randomly in that compound. Basically the priest takes merry of it to kill them. It is a ‘animal slaughter festival’ at Gadhimai because at a day huge animals are killed and at a time 50 to 60 priest enters on that prisoned animals ground for killing. They keeps focus on cutting animals head. All the above scene is watched by local police, environment activist but no one dare to stop it. 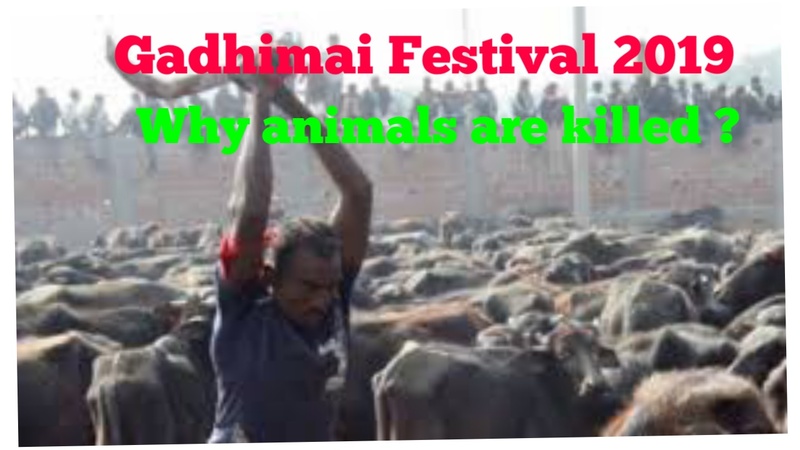 Why are the animals are killed in Gadhimai festival. To understand this thing we should know that Gadhimai is goddess. The people from Nepal and from some region of India from hindu religion believes that if they sacrifice animals they can lives life better or no harm on their family. They belives that Gadhimai godess will fulfill their wishes after sacrificing animal. Instead of sacrificing animals at individual level they gathers at temple place and such Gadhimai Festivals massacre happens Basically before some decades ago mortality rate was high so every family was anxious about their child. To keep their family happy such rituals are being played. There are also more reasons. 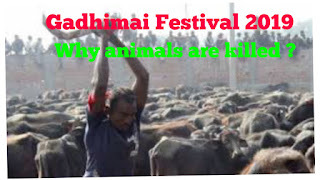 How many animals are killed in Gadhimai Festival ? In 2009 according to priest more than 10000 bufallows are slaughtered and smaller animals including the figure came out nearly 100000. 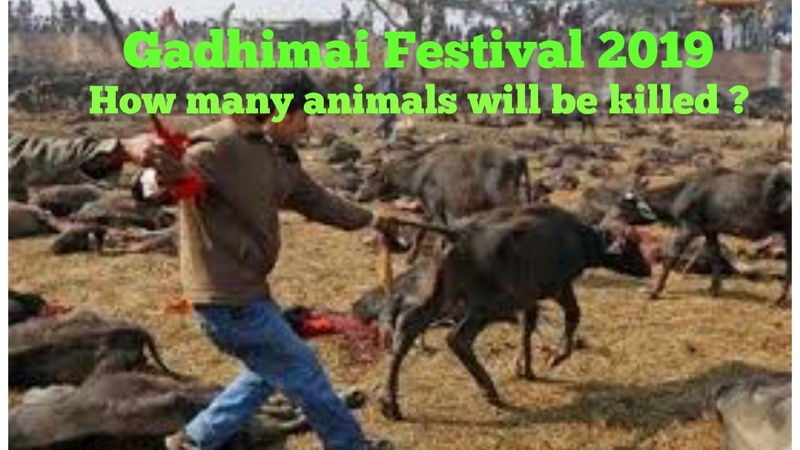 Organization like Animal Equality from India and other global organization doing work on this issue, because of their efforts and awareness in society in 2014 Gadhimai Festival 70% animals sluaughtering was reduced. It means still 30000 animals became scapegoat. Out of it 3000 we’re bufallows. Gadhimai Festival definitely celebrated for the sake of human according to their philosophy but when such massacre at Gadhimai is seen by children then it’s adverse impact also falls on them. There are many cases that children became mad or psychologically affected after watching dreadful moments. So, in this way Gadhimai Festivals is celebrated in Nepal for the sake of people but the big part of it massacre of animals at Gadhimai festival irritates but also a lot of change after 2009 event. We hope in next festival less number of animals should be killed.